Honestly, I wasn't even going to write a post about this spring wreath. It's so easy that it literally took about ten minutes and cost $9 using three bunches of faux carrots that I got at the craft store, a grapevine wreath, a couple of strips of burlap and a piece of ribbon that I found in the mess in my studio had on hand. It's the very best kind of project. one that requires no tools other than scissors. Here are the "directions" (and I use that term very loosely because if you're looking at it, you can pretty much tell what I did). 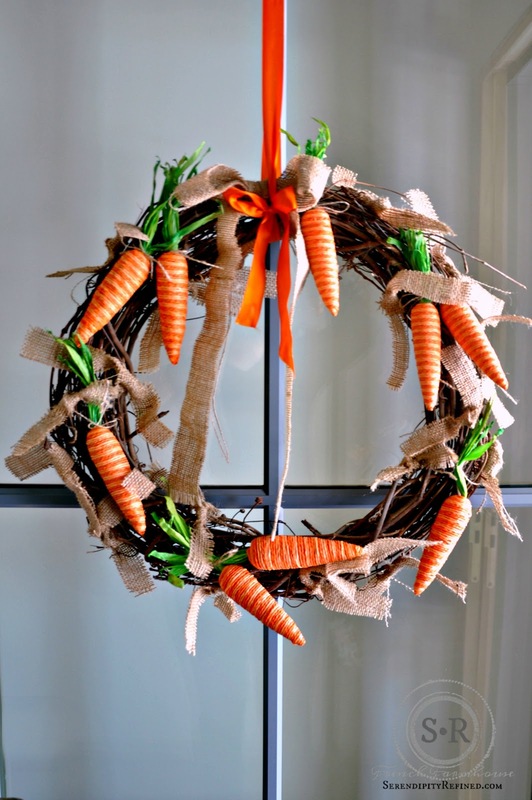 Place the grapevine wreath on the table.Take apart the bunches of carrots, cut strips of burlap 1 to 1/12 inches wide. Use the threads from the burlap to tie the carrots to the wreath (If you prefer, you can hot glue the carrots to the wreath but I like to reuse things and these will probably end up somewhere else in my spring decor next year if I can find them. Cut the burlap strips into 8 inch (approximate) pieces. 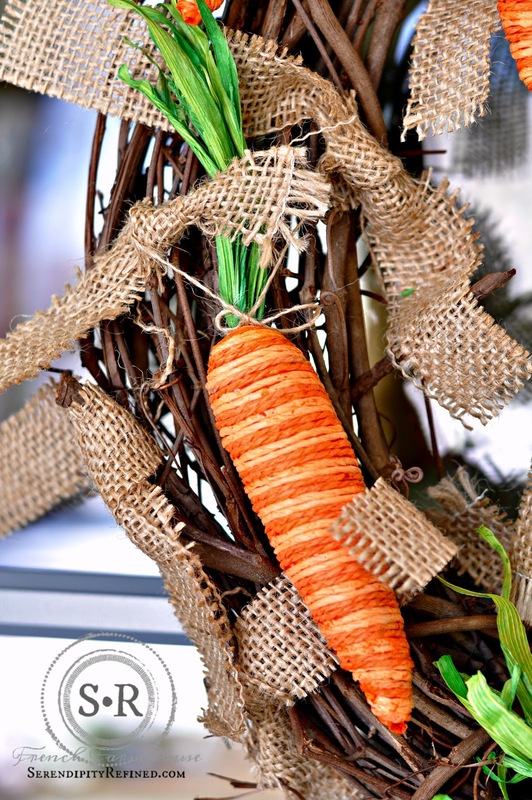 Tuck the pieces of burlap through the wreath and tie with a single loop. Make a bow out of a 1 1/2 inch to 2 inch wide strip of burlap. 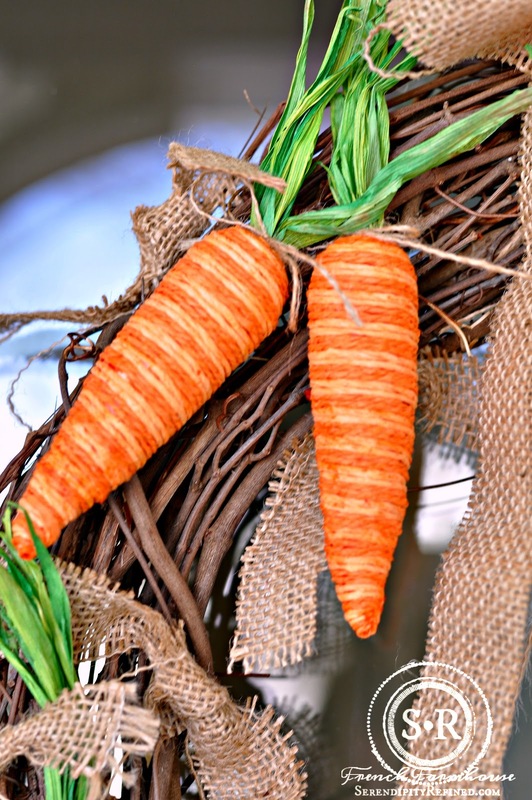 Thumbtack orange ribbon to the top of the door, tie the wreath onto the door using the ribbon. Put on your coat, and your boots, and your hat, and your gloves...and a scarf. Go outside. Stand back. admire your wreath. Take photos. 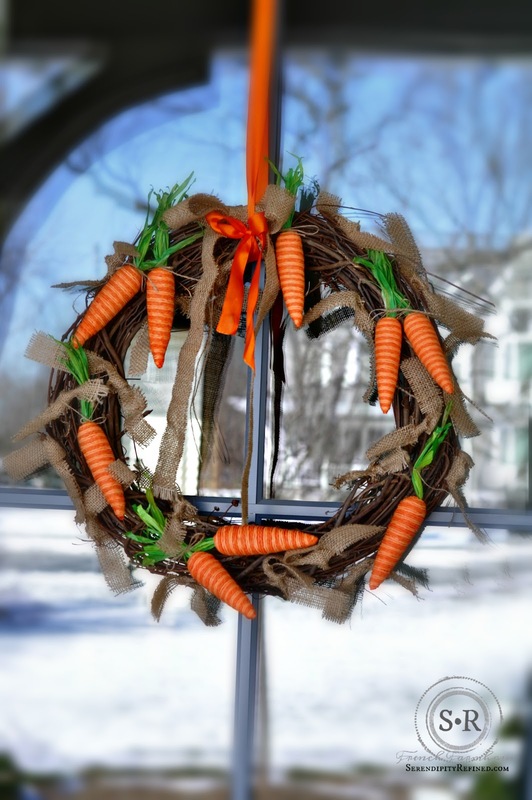 Explain to the mailman why you're standing outside in the cold taking photos of your wreath. Wonder why you still live in a place where it still snows in March and April and sometimes, May. Decide that it's too cold to stand outside pondering things that you can't control. Go inside and have another cup of coffee, tea, cocoa (since it's too early for wine).